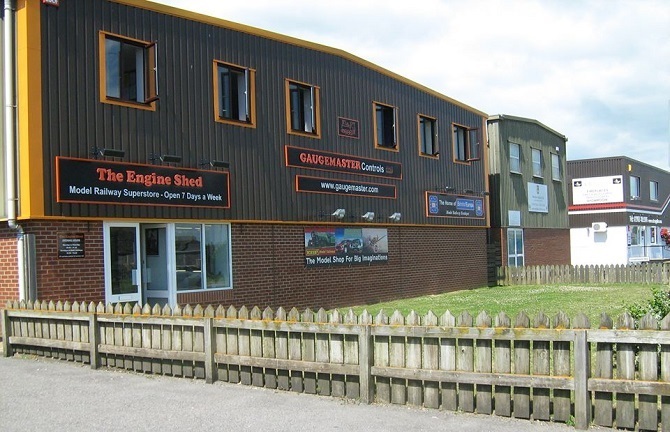 Gaugemaster Controls and the Engine Shed were formed in 1975 and 1974 respectively as two separate businesses, The Engine Shed – a local model shop in Bognor Regis, and Gaugemaster – an electronic sub assembly business in Worthing. In 1977 the first Gaugemaster Controller was produced, there being a demand for modern electronic controllers for the adult modeller which at that time was not being catered for. Between 1977 and 1982 both businesses became established, and after working together for a period, were joined together in the spring of 1982. During the early 1980’s a Mail Order department was started in addition to the shop, and then in 1984 a second shop was purchased in Worthing. After extensive renovation, the Worthing shop opened in November 1984. Between 1984 and 1987 the two retail shops both grew, together with an increase in mail order business, but most particularly the manufacturing of Gaugemaster controllers/transformers. Their distribution to the retail trade became established, and this made Gaugemaster the largest UK producer of model railway controllers and transformers. At the same time wholesale lines were added to compliment our range of controllers. This growth made it necessary and desirable to find new larger premises, and so in the spring of 1988 we purchased the Station Goods Yard at Ford Railway Station near Arundel in West Sussex.